Speed up your web experience by using the bookmarks bar. 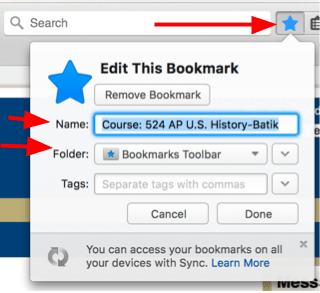 Bookmark the pages you use for class (Like a Moodle Class Page) so you can get there with one click after your browser opens. All web browsers have a feature that allows you to store your favorite websites and then easily access them with one click. The following tutorial shows you how to do this for Chrome, Explorer, and Firefox. Go to the start menu and click default programs on the right side of the menu. You can also type in Default Programs in the search bar. Click the option for Set Default Programs and then you will be given a window where you can choose which program you want to set as your default. Go to System Preferences under the Apple Menu. Select general and about halfway down the screen you will see a drop down menu for Default web browser. Select the browser of your choice from those installed on your machine. Now, navigate to the page you want to bookmark and select the star in the browser bar. A dialogue will pop up allowing you to select the name of the bookmark and where you want to store it. If you select Bookmarks bar, it will show up on the bar. Now, you can get to your Moodle class in one click. If you ever want to move the bookmarks on the bar, click the item and hold it so that you can drag it to the location of your choosing. Right click on the item to edit or delete the item. Then navigate to a website that you would like to make one of your favorites, like one of your Moodle classes. The website will now be added to the favorites bar. You can change the name of the favorite by right mouse button clicking on the favorite and then selecting rename. Now type in a name you can remember. You can move your favorites on the bar by left mouse button clicking on the item and holding it so that you can drag it to a location of your choosing on the favorites bar. Now, go and make a favorite for all of your Moodle classes so you can get Moodle going with one click when you go to the classroom. Now, navigate to the website you want to bookmark and when there, select the star that is to the right of the Search box. It will turn blue. Now, click the star again to open the edit the bookmark. You can change the name here and select the location where you want to be able to access the bookmark. If you want it in the toolbar, select that option from the Folder drop down menu. 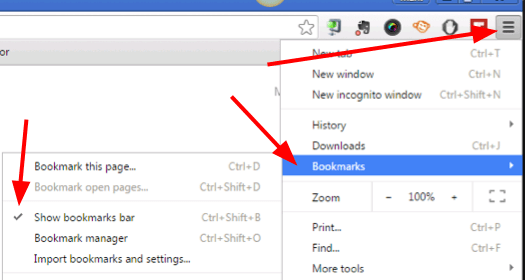 As with the others, you can move the location of the bookmark by clicking and dragging it in the toolbar. You can remove the bookmark by going to it and clicking the blue star and pressing the remove button.